As the days get colder in the Blue Mountains, and we pile on coats and scarves, one resident of the forests comes into his element. On the chilliest winter mornings his voice echoes around the valleys; he's arguably the most incredible songster and mimic in the bird world - the Superb Lyrebird. 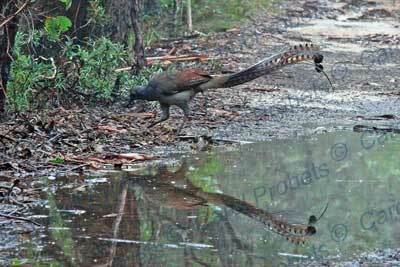 June-July is when the male lyrebird's display is at its peak. Often (but not always) using a low mound of scratched-up earth as a stage, he raises his long tail feathers over his head in a shimmering silver cascade. In an effort to attract females he pumps out a stream of mimicked bird calls - Gang-gang, Yellow-tailed Black-Cockatoo, Pied Currawong, Eastern Whipbird, Kookaburra, Golden Whistler and Pilotbird are some of his most commonly-mimicked sounds. He can imitate the bill-clapping of the Red Wattlebird, a whole flock of rosellas calling simultaneously, branches creaking, and a spinebill's wingbeats - all using his voice. One bird I've watched at Mt Victoria regularly mimics more than 20 different bird calls. 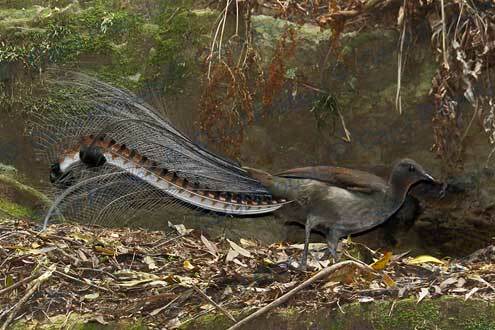 Interspersed with this mimicry is the lyrebird's own territorial call. This is the loudest part of the song - it can be heard more than a kilometre away - and generally consists of a series of loud whistled notes, with considerable geographic variation. There are also chopping, whirring, galloping, twanging, "clonk clonk" and clicking notes, which accompany the display and provide the "rhythm section" to which the bird dances. These notes can sound quite mechanical and are probably the origin of some of the stories which abound of lyrebirds imitating modern or artificial sounds such as axe blows and forest machinery. While there is no doubt that lyrebirds have the physical ability to mimic any sound at all (remember the David Attenborough footage of what was actually a captive-raised lyrebird mimicking a camera shutter and motor-drive), the reality is that they learn their song from other lyrebirds and therefore, in the wild, mimicry consists almost entirely of natural sounds. Because of this it takes some time for a new sound to find its way into the lyrebird's breeding song. For example, Sulphur-crested Cockatoos have greatly increased in the Blue Mountains over the past 30 years, before which they were rarely seen here. 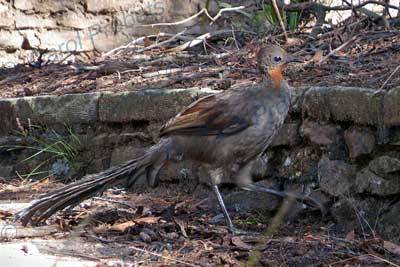 So far, I have never heard a lyrebird in the area mimic them. If you have, I'd love to know! The article above first appeared in the July, 2009 edition of Hut News.